The McDonnell Douglas KC-10 Extender is an aerial refueling tanker aircraft operated by the United States Air Force (USAF). A military version of the three-engined DC-10 airliner, the KC-10 was developed from the Advanced Tanker Cargo Aircraft Program. [N 1] It incorporates military-specific equipment for its primary roles of transport and aerial refueling. It was developed to supplement the KC-135 Stratotanker following experiences in Southeast Asia and the Middle East. The KC-10 was the second McDonnell Douglas transport aircraft to be selected by the Air Force following the C-9. A total of 60 KC-10s were produced for the USAF. The Royal Netherlands Air Force operates two similar tankers designated KDC-10 that were converted from DC-10s. The KC-10 plays a key role in the mobilization of US military assets, taking part in overseas operations far from home. These aircraft performed airlift and aerial refueling during the 1986 bombing of Libya (Operation Eldorado Canyon), the 1990–91 Gulf War with Iraq (Operations Desert Shield and Desert Storm), the NATO bombing of Yugoslavia (Operation Allied Force), War in Afghanistan (Operations Enduring Freedom), and Iraq War (Operations Iraqi Freedom and New Dawn). The KC-10 is expected to serve until 2043. During the Vietnam War, doubts began to be raised regarding the Boeing KC-135 Stratotanker fleet's ability to meet the needs of the United States' global commitments. The aerial refueling fleet was deployed to Southeast Asia to support tactical aircraft and strategic bombers, while maintaining the U.S.-based support of the nuclear-bomber fleet. Consequently, the Air Force sought an aerial tanker with greater capabilities than the KC-135. In 1972, two DC-10s were flown in trials at Edwards Air Force Base, simulating air refuelings to check for possible wake issues. Boeing performed similar tests with a 747. During the 1973 Yom Kippur War, the Air Force commenced Operation Nickel Grass to supply Israel with weapons and supplies. The operation demonstrated the necessity for adequate air-refueling capabilities; denied landing rights in Europe, C-5 Galaxy transports were forced to carry a fraction of their maximum payload on direct flights from the continental United States to Israel. To address this shortfall in mobility, in 1975, under the Advanced Tanker Cargo Aircraft Program, four aircraft were evaluated—the Lockheed C-5, the Boeing 747, the McDonnell Douglas DC-10, and the Lockheed L-1011. The only serious contenders were Boeing and McDonnell Douglas. On 19 December 1977, McDonnell Douglas's DC-10 was chosen. The primary reason of this choice was the KC-10's ability to operate from shorter runways. Initially, a batch of 12 aircraft was ordered, but this was later increased to 60. 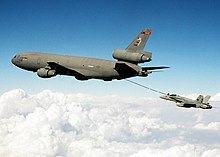 The KC-10 Extender first flew on 12 July 1980, but it was not until October the same year that the first aerial refuel sortie was performed. The design for the KC-10 involved modifications from the DC-10-30CF design. Unnecessary airline features were replaced by an improved cargo-handling system and military avionics. Meanwhile, the KC-10 retains 88% commonality with its commercial counterparts, giving it greater access to the worldwide commercial support system. Other changes from the DC-10-30CF include the removal of most windows and lower cargo doors. Early aircraft featured a distinctive light gray, white and blue paint scheme, but a gray-green camouflage scheme was used on later tankers. The paint scheme was switched to a medium gray color by the late 1990s. The KC-10's mixed refueling system of hose-and-drogue and flying-boom allow it to refuel the aircraft of the U.S. Air Force, U.S. Navy, U.S. Marine Corps and allied forces. The most notable changes were the addition of the McDonnell Douglas Advanced Aerial Refueling Boom (AARB) and additional fuel tanks located in the baggage compartments below the main deck. The extra tanks increase the KC-10's fuel capacity to 356,000 lb (161,478 kg), nearly doubling the KC-135's capacity. The KC-10 has both a centerline refueling boom—unique in that it sports a control surface system at its aft end that differs from the V-tail design used on previous tankers—and a drogue-and-hose system on the starboard side of the rear fuselage. The KC-10 boom operator is located in the rear of the aircraft with a wide window for monitoring refueling. The operator controls refueling operations through a digital fly-by wire system. Unlike the KC-135, the KC-10's hose-and-drogue system allows refueling of Navy, Marine Corps, and most allied aircraft, all in one mission. The final twenty KC-10s produced included wing-mounted pods for added refueling locations. The KC-10 can also carry a complement of 75 personnel with 146,000 lb (66,225 kg) of cargo, or 170,000 lb (77,110 kg) in an all-cargo configuration. The KC-10 has a side cargo door for loading and unloading cargo. Handling equipment is required to raise and lower loads to the cargo opening. It can carry cargo and serve as a tanker on overseas missions. A need for new transport aircraft for the Royal Netherlands Air Force (Koninklijke Luchtmacht) was first identified in 1984. The 1991 Gulf War highlighted the deficiencies in mobility of European forces. In 1991 four categories of transport requirements were established. Category A required a large cargo aircraft with a range of at least 4,500 km and the capability to refuel F-16s. In 1992, two DC-10-30CFs were acquired from Martinair in a buy/leaseback contract. When one of the two aircraft was lost in the Martinair Flight 495 crash, a third aircraft was bought from Martinair. The conversion was handled via the United States foreign military sales program, which in turn contracted McDonnell Douglas. Costs for the conversion were initially estimated at $89.5 million (FY 1994). The aircraft were to be equipped with both a boom and a probe and drogue system. However, because McDonnell Douglas did not have any experience with the requested Remote Aerial Refueling Operator (RARO) system, and because the third aircraft differed from the original two, the program could not be completed at budget. By omitting the probe and drogue system and a fixed partition wall between the cargo and passenger, the cost could be limited at $96 million. To make up for the cost increase McDonnell Douglas hired Dutch companies to do part of the work. The actual converting of the aircraft was done by KLM. Conversion of the aircraft was done from October 1994 to September 1995 for the first aircraft and from February to December 1995 for the second. This was much longer than planned, mostly because McDonnell Douglas delivered the parts late. This would have again increased the cost, but in the contract for the AH-64 Apaches which the Royal Netherlands Air Force also bought from McDonnell Douglas, the price was agreed to be kept at $96 million. To modernize the KC-10, the USAF has awarded a contract to Boeing in 2010 to upgrade the fleet of 59 aircraft with new Communication, navigation and surveillance and air traffic management (CNS/ATM) system. This was to allow the aircraft to fly in civil airspace as new ICAO and FAA standards took effect in 2015. Rockwell Collins was also awarded a contract in 2011 for avionics and systems integration for the cockpit modernization program. The first KC-10 was delivered to the Air Force's Strategic Air Command (SAC) in March 1981 at Barksdale AFB. In 1982 a newly re-named 22nd Air Refueling Wing (formerly the 22nd Bombardment Wing) was re-equipped with KC-10A Extenders and became the 2nd Air Force Unit to operate the new tankers. The 60th and final KC-10 was delivered on 29 November 1988. The KC-10s served with SAC until 1992, when they were reassigned to the newly established Air Mobility Command. In the aerial refueling role, the KC-10s have been operated largely in the strategic refueling of large number of tactical aircraft on ferry flights and the refueling of other strategic transport aircraft. Conversely, the KC-135 fleet has operated largely in the in-theater tactical role. There are 59 KC-10 Extenders in service with the USAF as of 2010. The USAF's KC-10s are stationed primarily at Travis AFB, California, and Joint Base McGuire-Dix-Lakehurst formerly known as McGuire AFB, New Jersey. A USN F-14D and two F/A-18Cs prepare to refuel from a KC-10 in 2005 over the Persian Gulf. When faced with refusals of basing and overflight rights from continental European countries during Operation El Dorado Canyon, the U.S. was forced to use the UK-based F-111s in the 1986 air-strikes against Libya. The KC-10s and KC-135s allowed 29 F-111s, along with other Air Force and Navy aircraft, to reach their targets. 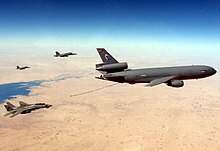 The KC-10 again played a key role during Operations Desert Shield and Desert Storm in 1991; KC-10s facilitated the deployment of tactical, strategic, and transport aircraft to Saudi Arabia. In the early stages of Operation Desert Shield, aerial refueling was key to the rapid airlift of materiel and forces. In addition to refueling airlift aircraft, the KC-10, along with the smaller KC-135, moved thousands of tons of cargo and thousands of troops in support of the massive buildup. The KC-10 and the KC-135 conducted about 51,700 separate refueling operations and delivered 125 million gallons (475 million liters) of fuel without missing a single scheduled rendezvous. Since then, the KC-10 had participated in other smaller conflicts. In March 1999, NATO launched Operation Allied Force against the government of Yugoslavia. The mobility portion of the operation began in February and was heavily dependent on tankers. By early May 1999, some 150 KC-10s and KC-135s deployed to Europe where they refueled bombers, fighters and support aircraft engaged in the conflict. The KC-10 flew 409 missions throughout the entire Allied Force campaign and continued support operations in Kosovo. Since 11 September 2001, KC-10s had also flown more than 350 missions guarding U.S. skies as a part of Operation Noble Eagle. During Operations Enduring Freedom and Iraqi Freedom, KC-10s have flown more than 1,390 missions delivering critical air refueling support to numerous joint and Coalition receiver aircraft. KC-10s are expected to serve until 2043. The Air Force considered retiring its fleet of KC-10 tankers in response to sequestration budget cuts as part of the service's FY 2015 budget. 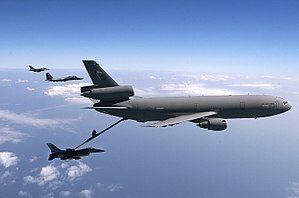 A "vertical chop" to divest all KC-10s was suggested because there are fewer KC-10s than KC-135s, having three different tanker models in service (after the introduction of the KC-46) would be costly, and a "horizontal cut" across the refueling fleets would achieve small efficiencies. Some believed retiring the KC-10 would not benefit the Air Force, given that it is equipped with both boom and hose-and-drogue refueling systems and the fleet's relatively young age. At first, officials claimed that the initial focus on retiring the KC-10 in September 2013 was a "trial balloon" to call attention to Air Force operating cost issues; as of early 2013, the KC-10 had a per hour flying cost of $21,170 and a mission capable rate of 87 percent. A FY 2015 budget plan did not include cuts to the KC-10. The two Dutch KDC-10s are used for both refueling and transport. They are stationed on Eindhoven Airport as part of the 334th Transport Squadron. Of the 5,500 hours flown in the first 3 years of use, the aircraft were used in their tanker role for 50% of the time. Besides being used by the air force and NATO allies, the KDC-10s are also used to support peacekeeping and humanitarian aid operations. Of the first three years, 32% of the flight hours were used for peacekeeping and humanitarian aid. In this function, the aircraft have been deployed to Kosovo to evacuate refugees, to the Caribbean and Central America to provide humanitarian aid after the hurricanes Luis, Georges and Mitch and to various countries in Africa and Asia to provide development aid. In 1998, the aircraft were also used to evacuate Dutch citizens from Indonesia during the Fall of Suharto. Dutch KDC-10s have been operating out of Manas AFB in support of allied forces during Operation Enduring Freedom and in support of Allied Air Force over Iraq and Syria. A third plane was to have been received in 1992 from the Dutch airline Martinair as a conversion from a passenger airliner but was destroyed in the crash of Martinair Flight 495 at Faro Airport. Commercial refueling companies Omega Aerial Refueling Services and Global Air Tanker Service operate two KDC-10 tankers (N974VV and N852V, respectively) for lease. They were converted from DC-10-40s and provide probe and drogue refueling capabilities from wing pods similar to the KC-10. In June and July 2011, Omega Air's KDC-10 supported 3 of Royal Australian Air Force's F/A-18 Hornets, en route to Red Flag – Alaska. Royal Netherlands Air Force operates 2 KDC-10s. 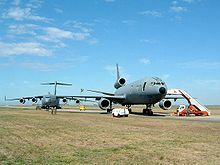 On 17 September 1987, KC-10A serial number 82-0190 was undergoing maintenance on the ground at Barksdale AFB, Louisiana and suffered an explosion and subsequent fire. The KC-10 was significantly damaged and written-off. One member of the ground crew died in the fire. ^ The Handley Page Jetstream had been initially ordered as the C-10A, but was soon canceled. This allowed the tanker version of the DC-10 to be designated KC-10A. ^ a b c d e f g "Factsheets: KC-10 Extender". US Air Force. May 2014. Retrieved 30 November 2013. ^ a b Waddington 2000, pp. 116–120. ^ Endres 1998, p. 65. ^ a b c d Steffan 1998, p. 103. ^ Frawley 2002, p. 119. ^ a b c d e Steffan 1998, p. 104. ^ "KC-10A Extender: Background". Globalsecurity.org. Retrieved 27 August 2011. ^ Eden 2004, p 286. ^ "KC-10A Extender: Characteristics". Globalsecurity.org. Retrieved 27 August 2011. ^ a b Steffen 1998, pp. 103–107. ^ Eden 2004, p 287. ^ a b c d "Evaluatie project KDC-10". Ministerie van Defensie (in Dutch). 1 July 1999. Retrieved 5 January 2014. ^ Steffen 1997, p. 107. ^ a b Trimble, Stephen (24 June 2010). "Boeing outlines C-130H and KC-10 cockpit upgrades". Flightglobal.com. Retrieved 19 September 2010. ^ "Boeing Wins CNS-ATM Upgrade Contract for USAF's KC-10 Tankers". Defenseindustrydaily.com. 21 August 2014. Retrieved 16 March 2017. ^ "Rockwell Collins awarded contract for KC-10 CNS/ATM cockpit upgrade program". Retrieved 16 January 2019. ^ Steffen 1998, pp. 104, 107. ^ "Operation El Dorado Canyon". Globalsecurity.org. Retrieved 27 August 2011. ^ Veronico and Dunn 2004, p. 58. ^ WEISGERBER, MARCUS; MEHTA, AARON (15 September 2013). "USAF Weighs Scrapping KC-10, A-10 Fleets". www.defensenews.com. Gannett Government Media Corporation. Retrieved 30 October 2013. ^ Steffen 1997, pp. 106–107. ^ "Frequently Asked Questions". Omega Air Refueling. Archived from the original on 28 July 2011. Retrieved 27 August 2011. ^ "KDC-10 Air Refueling Tanker Aircraft." Archived 4 July 2008 at the Wayback Machine Global Airtanker Service. Retrieved: 19 September 2010. ^ "KDC-10: Primary Options." Archived 28 August 2008 at the Wayback Machine Global Air Tanker Services. Retrieved: 25 February 2008. ^ "RAAF Hornets Participate in Red Flag Alaska" Air Forces Monthly (Key Publishing), Issue 282, September 2011, pp. 37. ISSN 0955-7091. Retrieved: 30 September 2011. ^ "380TH AIR EXPEDITIONARY WING > U.S. Air Forces Central Command > Fact Sheets". Afcent.af.mil. Retrieved 16 January 2019. ^ John Pike. "60th Air Mobility Wing [60th AMW]". Globalsecurity.org. Retrieved 16 January 2019. ^ "349th Air Mobility Wing History Facts > 349th Air Mobility Wing > Display". 349amw.afrc.af.mil. Retrieved 16 January 2019. ^ "514th Air Mobility Wing". 514amw.afrc.af.mil. Retrieved 16 January 2019. ^ "How The Air Force's New KC-46 Tanker Could Become A Hundred-Year Franchise For Boeing". Forbes.com. Retrieved 16 January 2019. ^ "McDonnell Douglas KC-10A 82-0190." Aviation Safety Network Database. Retrieved: 19 September 2010. ^ Steffen 1998, p. 107. Frawley, Gerard (2002). The International Directory of Military Aircraft, 2002–2003. Fyshwick, Australia: Aerospace Publications. ISBN 978-1-875671-55-7. Steffen, Arthur A. C. (1998). McDonnell Douglas DC-10 and KC-10 Extender. Hinckley, Leicester, UK: Midland Publishing. ISBN 978-1-85780-051-7. Waddington, Terry (2000). McDonnell Douglas DC-10. Miami, Florida: World Transport Press. ISBN 978-1-892437-04-4. Endres, Gunter (1998). McDonnell Douglas DC-10, Volume 10. Grand Rapids, Michigan: Zenith Imprint. ISBN 978-0-7603-0617-8. Wikimedia Commons has media related to McDonnell Douglas KC-10 Extender.